When I was younger, I really hated the word "nice" as a descriptor of people. I thought nice meant boring. I hoped that no one would ever use "nice" as the first word to describe me. I was so much more! Fun and witty and opinionated and all the rest. I wasn't boring. And I didn't want to be thought of as just nice. I'm in my early 30s now, and my perspective has completely changed. I love nice people. I would be thrilled if someone were to describe me as "just a really, really good person." I can't think of any personality trait that I find more attractive than kindness, except perhaps a sense of humor that is similar to mine. 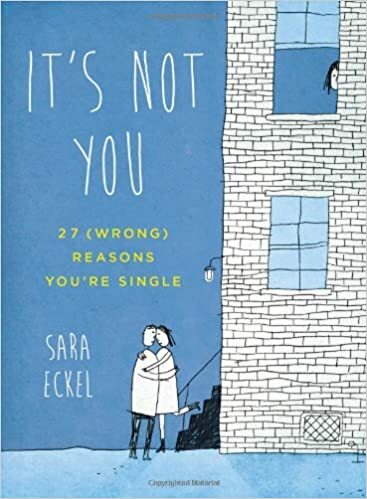 Sara Eckel's book, It's Not You: 27 (Wrong) Reasons You're Single, is a kind book. It is a longer version of her excellent, very popular Modern Love essay in the New York Times. It's about being kind to yourself, which can often be very difficult, especially if you are a single woman in your 30s or 40s. Inevitably, people think there is something wrong with you. Eckel does not. She says that if you're single, it's not because something's wrong with you. It's because finding someone is hard. It takes a lot of luck. It's about timing. And if it happens, that's great. But if it doesn't, it's not your fault. You are no less worthy of love than other people are. So many things that Eckel brings up here as the reasons why women are single (you're too picky, you're too intimidating, you're too available, you need more practice, you aren't playing the game, etc.) are things that have been said to me by well-meaning friends and pretty much complete strangers. Eckel takes 27 of the most common reasons self-help books and well-meaning friends tell you that you're single and refutes them. She tells you why vulnerability is a good thing, why you should stand up for yourself. She is just that really wonderful girlfriend who listens to you and doesn't judge you but instead gives you support and a really excellent hug. I've been single for pretty much my entire life. I have done so many of the things Eckel mentions here. She talks about all the projects and tasks single women take up, trying to make themselves more well-rounded, better, worthier people for relationships. They exercise, they learn to cook, they host dinner parties, they volunteer in their communities, they travel alone, they work really hard to make new friends and keep long-established friendships alive. And it's true. I am in the best shape of my life right now, I have more friends than I've ever had before, I make sure that I have a full calendar (though I will never use the word "busy" to describe myself as I hate that word), and I put myself out there far more often, and in ways that make me quite a bit more uncomfortable, than I ever would have thought possible even 5 years ago. Being single has made me into a better person, even if being single can be really hard sometimes. But has it made me more "worthy" of finding someone? No. Eckel talks a lot about self-compassion and Buddhist teachings (though she does not consider herself a Buddhist). This is an idea I have been thinking about quite a bit over the past several months, mostly because I think so many people are kind to others but are not kind to themselves. We do not trust ourselves, we do not give ourselves credit for going out there and giving it the ole college try, we assume there must be something wrong with us. Eckel references a TED Talk by Brene Brown that I looked up after finishing the book. It's about the power of vulnerability, and it is excellent. Brown says, yes, it's hard to make yourself vulnerable. It makes you feel weak, it makes you feel exposed, and it can be horrible when it doesn't go well. But... making yourself vulnerable also opens you up to richer, more wonderful relationships with people. It gives people the opportunity to be vulnerable with you, too. You learn more about someone. Your friendship deepens. You are kinder, gentler, more forgiving. They are, too. And it's worth it. "The people who have a strong sense of love and belonging believe they are worthy of love and belonging. That's it." Eckel also talks about the whole "ice queen" idea - that if a woman really wants to get a man's attention, she should basically ignore him and pretend she doesn't care about him, because if he realizes she cares, then he'll leave. Of every piece of dating advice out there, this one always comes up. Don't show too much interest. Play the game. Don't respond to his text for like, 8 hours, even though everyone knows you saw the text as soon as it was sent because what are the chances you don't have your phone with you? Think about the most self-assured people you know. Are they inconsiderate, selfish, or withholding? Do they try to make you feel small and powerless? Or are they the ones who offer to take your coat and give you their full attention when you tell them about the book you're reading? Are they the ones who notice when you've done something well and tell you so? Like I said, I want to be the nice person. I don't want to be the cause of angst or anxiety in someone else's life, I want to be a source of support. And that's why I think this book was so great. It was not at all self-help-y, it was not about finding ways to find guys, it was not about anything except feeling good about yourself. And that means a lot. I want to find a guy who delights and surprises me as much as my friends do, but I also want to make out with. Something else I read this year I think you might like: On Kindness by Barbara Taylor and Adam Phillips. It doesn't sound snobbish at all! I, too, dislike self-help sounding books. That's why I was so thrilled with this one, she does nothing to tell you what you should change about yourself, she just gives you a different lens through which to look at your life. It didn't feel life self-help to me at all. I could definitely see Brown's book being more self-help like, though, as I think she has every possible level of degree in social work, and the goal of social work is obviously to help people. I'll look into On Kindness for sure! I haven't done much READING on the subject, more listening to podcasts and talks about kindness and empathy, but I trust your recommendations. And of course I know you well enough that you don't have to worry! Love this post! I really related to what you wrote and can definitely say that I value kindness so much more now that I'm older. I definitely need to check out Brown's video. Thanks for this post! Definitely look at Ana's recommendations above as well! Oh my god, this book sounds so perfect and also I think we might be the same person? I honestly feel like even if I'm single forever, at least I'm an interesting person to myself, yknow? I need this book immediately though! At almost 43 and never married (and rarely dating), I've heard those same reasons, too. I'm sure that there are things I could do to increase my changes of meeting someone, but I decided a while ago that I'm not going to invest a lot of time in doing things I don't enjoy on the off-chance that it will be lead to a relationship that may or may not make me happier than I am right now. But it's hard not to worry that something's wrong with you when you're single for a long time. It's nice to see someone say that it's not about merit but about luck and timing and so on. And, honestly, I'm glad I didn't marry when I was younger because I'm pretty sure that I'd be miserable now with the sorts of men I knew then. Sometimes what looks like bad luck turns out to be good luck. Well, and hopefully the things you DO spend time on would introduce you more to people that are likely to appeal to you (men and women) vs doing things that you don't like. I have definitely made more friends through doing things I like vs things I don't like :-) But I think my definition of "things I like" has expanded a lot, too. I really relate to this post too. Having been out with several men over the last couple of years who were interesting and exciting, but not particularly nice or kind; I'm currently going out with one, who is, yes, interesting and funny, but most of all he's kind. I think that kindness and niceness are much under-rated. My younger self would have been shocked by that, my older self knows it's true. Yes, very true! I wonder why that is. For me, maybe when I was younger I thought that you couldn't be nice and also be witty or sarcastic or funny or sharp. And now I realize that you can be all those things together. It's more that you can't be nice and catty, or nice and mean, or nice and bullying/intimidating. And I'm ok with that. I got married right after college and it was the right choice for me and I've never regretted it. But now I have a daughter who is very tall and intelligent and has been out of college for a year and already feels some of the things you talk about in this post. I think I need to read this book so I'll know helpful things to say when she feels down. I have no repertoire of motherly advice for this situation, and don't want to say the less helpful and irritating things. Awesome. Love it. Love you. You ARE nice. And smart and fun and all those cool things even though we've never really met, blahblahblah. I have no advice and I think that is a good thing. We need support for each other and self-kindness and laughter. Yep. FOUR SLICES OF PIE to this comment, Care :-) Delicious, homemade cherry pie, no less. I think cherry pie is my favorite. I also love blueberry pie. I love all fruit pies, I do not discriminate, as long as they have two crusts because I like a strong butter/flour/fruit ratio. I'll email you my address! Great post Aarti, sound like a great book, too. I must find this book, and I love this post. I've been single for a long time and it *is* easy to think that something is wrong with me. However, maybe all that's "wrong" with me is that I don't want to "shop" for guys one a dating website, that I don't have any interest in playing "the game" and probably wouldn't want really want to be with somebody who wanted to toy with me anyway. Here's to being nice and kind to each other and ourselves, living good lives with lots of friends and experiences, and if the right guy comes along to share that good life with, so much the better. Interesting review. Thank you. I had that moment of luck and timing twenty years ago and have been with my partner ever since. But I know that it was just luck, just the two of us in the same place, geographically and in life, at the same time that made it happen. It had nothing to do with either of us doing the right thing or being a "good" person. In fact both of us were basically resigned to being single for life when we met. And we were both basically okay with that.